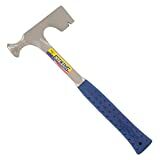 The Estwing hammers are built tough, they last for decades. My drywall hammer was purchased more than 20 years ago and is still as good as new. I don't do drywall every day, only for my own appartment repairs, but if you have to do the job you need the best tools. It's balanced about right, the blade is tough for chopping stuff out of the way, and the face has just the right dimples.